Pickle juice. Cheese brine. Chicken grit. Coffee grounds. As awareness of road salt's impacts on lakes and rivers grows, public works agencies and homeowners alike are on the lookout for safer alternatives. But do any of them work? And are they really better for the environment? Road salt is a popular de-icing tool because it's widely available, effective and relatively cheap. Each winter, some 730 million pounds of salt are dumped on Minnesota's roadways — plus more on parking lots, driveways and sidewalks. But the chloride in road salt corrodes vehicles and bridges and can be harmful to pets. It also causes major environmental damage when it washes into groundwater, lakes and rivers, where it's toxic to fish and other aquatic life. Compounding the problem: Chloride is a permanent pollutant. There's no way to remove it from water without expensive treatment. • Road salt and icy winter: How do we balance safety and water pollution concerns? 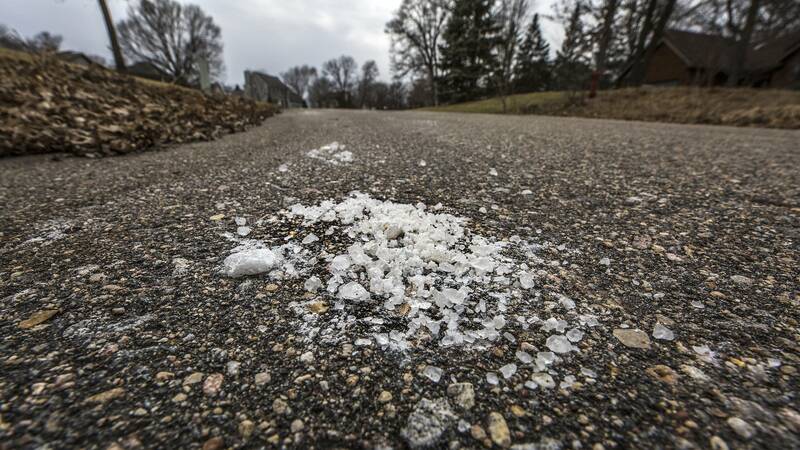 Public works agencies around Minnesota have been trying to reduce the amount of salt they use on winter roads to save money — and the environment. They're using snowplows equipped with technology that measures the surface temperature of the pavement and adjusts the salt distribution accordingly. Many departments are switching from road salt to a liquid saltwater brine that sticks to the pavement better and doesn't bounce off into the ditch. In other states, road agencies have tested different food byproducts — including pickle juice, cheese brine and beet juice — as de-icers. Some are effective, but they usually require added salt in order to really work, anyway, said Brooke Asleson, water pollution prevention coordinator for the Minnesota Pollution Control Agency. And there's still an environmental impact, she said. When the organic material in those alternative remedies washes into lakes or streams, it can deplete the dissolved oxygen in the water, leaving too little for fish and aquatic life. Few cities anywhere in the country have as challenging a confluence of winter conditions as Duluth, where steep hills, heavy snowfalls and lake-effect wind and moisture test road maintenance crews. 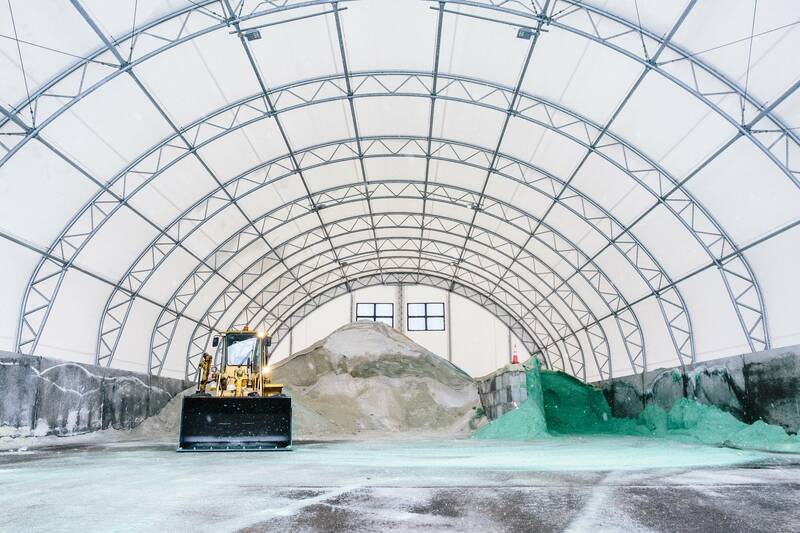 The Minnesota Department of Transportation has been experimenting with potassium acetate as an alternative to road salt on some of the area's most heavily used bridges, tunnels and traffic routes near downtown Duluth. Chris Cheney, maintenance operations superintendent for the department's Duluth district, said the chemical has shown some promise. It's better at melting ice in cold temperatures, he said. Salt isn't effective at melting ice when the temperature falls below about 15 degrees. Potassium acetate is a liquid solution and costs about three times as much as road salt, Cheney said. But crews are using much less of it than they do road salt, so the cost ends up being about the same, he said. The environmental impacts of potassium acetate are still unclear. Unlike chloride, the chemical eventually breaks down in the environment, Asleson said, but lab tests have shown it's toxic to aquatic insects. She said more research is needed. Connie Fortin, a consultant who trains maintenance crews on smart salting techniques, said there's no "silver-bullet" de-icer that will replace road salt. 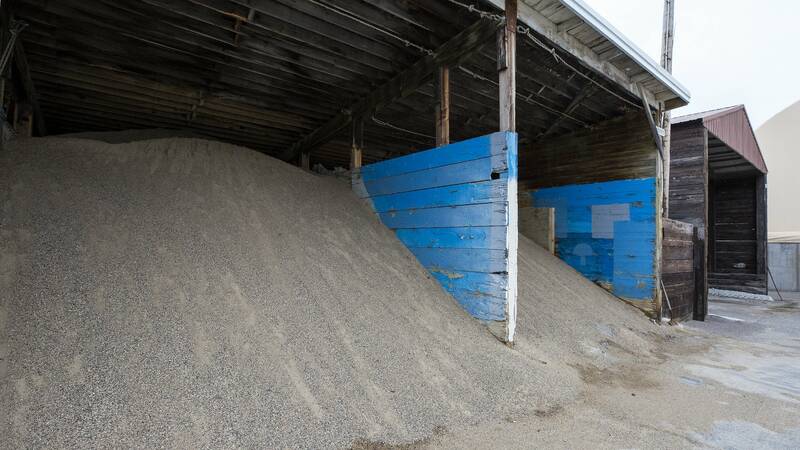 "I think our biggest savings will be in just waste reduction," Fortin said. "So don't overapply. Apply it so that it stays on the road." 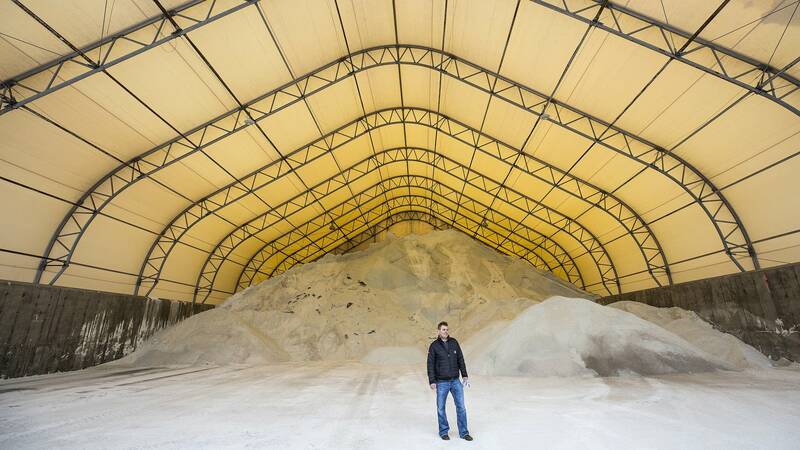 • Related: Could 'smart salting' keep Minnesota roads and waters safe? Many homeowners are looking for their own environmentally-safer solutions for icy sidewalks and driveways. There are a lot of products out there that are advertised as safe or eco-friendly, Asleson said, but added that there are no regulated labeling requirements for de-icing products, so it's hard to know for sure if that's true. 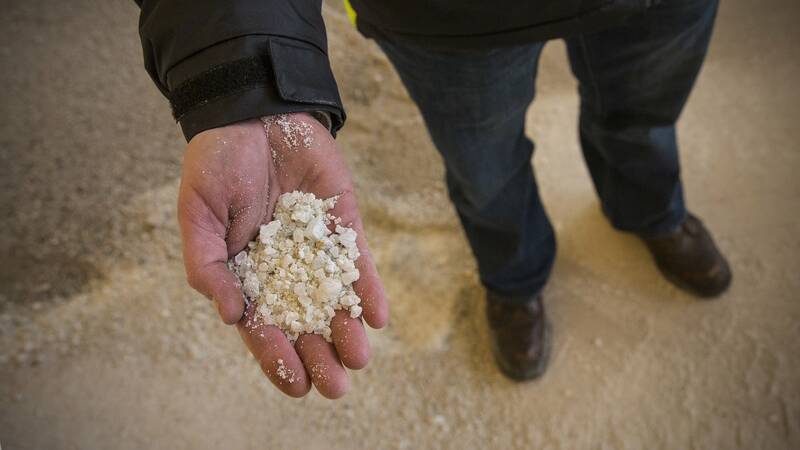 "If somebody wants to say that their salt product they're selling is environmentally friendly, there's no laws in place making them prove or show that, in fact, it's a benefit to the environment," she said. When you're looking at labels, she said, products without sodium might be better for your lawn. But if they contain chloride, they're still harmful for lakes and streams. "It's still a chemical, and it's still going to have an impact on the environment," Asleson said. Some people swear by their own home remedies, like chicken grit — a material made mainly of crushed stone fed to birds to help their digestion — coffee grounds or kitty litter. While each of those alternatives might provide a little traction on slippery surfaces, they won't melt the ice. For those really slippery spots where traction is needed, a good strategy might be to sprinkle a little sand. But be sure to sweep it up later, she said, before it gets washed away and clogs up the storm sewer or causes sediment problems in lakes and streams. You've got to keep your sidewalks clear, but you're concerned about salt pollution. What should you do? At home, get out that shovel and broom. Clear as much snow and ice from your sidewalks and driveways as possible before you reach for a de-icing product. "Then, if you did have to apply de-icers, there's really not much there to melt," Fortin said. If you really need salt or sand, use it sparingly and only on patches that you know are icy. Consider buying cleats that you can put over your shoes or boots to avoid slips and falls. Fortin said perhaps the best solution is to adjust to the reality of winter in Minnesota. After a storm, plan ahead for difficult driving conditions and don't expect roads to be free to snow and ice. And drivers should take it easy on their local public works crews, Fortin said. "They need to take the pressure off their city, the county and the state to have instantly clean roads," she said. "We are paying for this with a huge price tag, and that's our children's future water supply."